Traditional biker jacket details include the buckle-fastening throat strap, adjustable studded cuffs, a stiffened waist belt and the famous four studded pockets – one of which is the authentic slanted map pocket, designed to give easy access while riding. 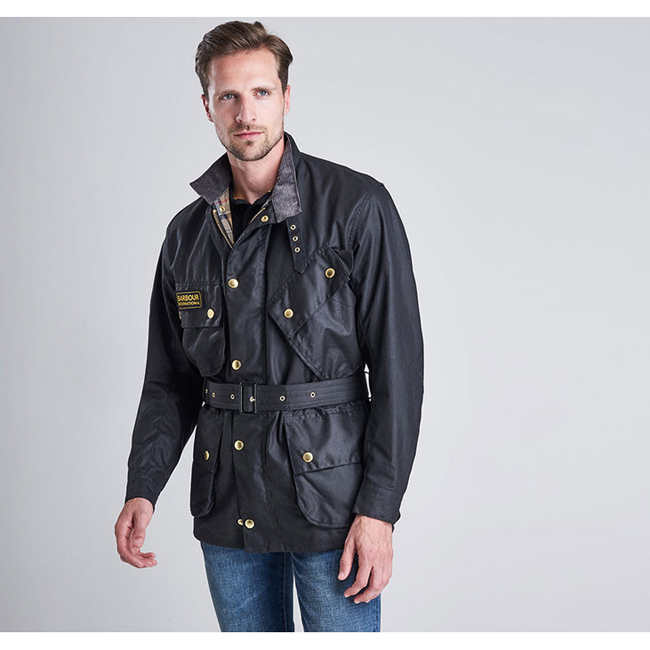 Part of the World Tour collection, the International Original is available in classic Black with the inimitable Barbour International logo to the chest. I bought this for an Ireland/Scotland cruise trip in June 2018. Original price was $30+ but with Amazon points came down to $26. While I am glad I had it for this trip, I don't think it is not quite worth even the $26 though. My husband purchased the $40 Columbia Men's Glennaker Lake Packable Rain Jacket, and it seemed to have no problems beyond the same non-breathability. It has all the same features as mine, and even has an inner pocket! To be fair, he actually hardly wore it so maybe it needs to be tested more. As for myself, the main physical activity that happened while wearing this jacket was walking. -Not breathable at all. Gets slick inside and steams up my watch even in cool and mildly humid weather. -Elastic strip that allows you to tighten the hem of the jacket ripped easily on my left side from just a gentle accidental tug, so I looped and tied the end around itself and clamped it to get it to not dangle. As a result, this jacket was not exactly wind resistant, allowing wind to fly right inside from underneath! I'll try to attach a picture to show. -Zipper doesn’t unzip on the left pocket because it is somehow missing (or always had missed or something popped?) a piece to stop for the zipper. It got caught and bent the teeth. Again, I'll try to attach a picture. I ended up trapping my phone in it on accident, twice! After husband and I both wrangled and pulled at the zipper, I used a pen (the only pointy thing I had) to jam it around the small opening at the top of the zipper and twist it around. It came free astonishingly easily the first time. However, during the second time, my pen tip snapped off and things got inky. Husband ended up ripping the zipper off which allowed me to tease apart the zipped section manually, but of course then I couldn't zip it back. -Packability: extremely easy to pack but now with the left zipper broken off, I can’t zip the pack shut. -Light construction: VERY thin, helps it pack! I would recommend this if you don’t have high expectations beyond light construction and packability. Expected a bit better from Columbia as I have two fleeces by them that I’ve owned for years. Both of those have been reliable all the time and great for cool and cold weather.